Connect with owners and executives from the nation’s largest modular, concrete, panel, log and timber frame companies. 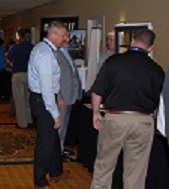 Meet new customers and strengthen relationships at the leading conference for systems-built residential construction in the United States. Held in charming Knoxville, Tenn., the conference will provide outstanding opportunities for you to connect with the decision-makers from the nation’s largest modular, panelized, log and timber home builders and manufacturers. General sessions with leading experts covering cutting-edge topics critical to the success of your customers. Interactive panel discussions where you’ll learn and mix and mingle with company owners and executives of systems-built housing. Social and networking events that provide you with a casual and fun time to bond with the industry’s leading players over drinks and refreshments. Don Berey, Sponsorship Sales Manager, 202-266-8208. Andersen Windows Andersen Windows has the strongest brand in the window and door industry and its products are known for superior performance, reliability and integrity. Andersen manufactures hundreds of thousands of sizes, shapes and styles of windows and patio doors, and offers custom products with features not readily available from most manufacturers. CabinLife.com Cabinlife.com is a digital-only resource for all things cabin related. Featuring classic cabin home tours (log/timber, modular, panelized and stick built), maintenance and restoration information, lifestyle articles and cabin-related products, Cabinlife.com is a one-stop resource for cabin owners and soon-to-be-owners across North America. Citizens Bank Citizens Bank is the 12th largest retail bank in the US and is a full service lender with roots dating back to 1828. Headquartered in Providence, Rhode island, Citizens provides competitive financing options for clients in all arenas including Conventional, FHA and VA. There are many programs for first time/move up buyers and investors alike. Our Portfolio ?Single Close? construction loans top off our extensive list of non-conforming loan programs for Primary, Secondary and Multi-Unit residences. Cobalt Creed, LLC Cobalt Creed Is focused on providing the Unico HVAC technology direct to high performance home builders, modular builders, government and custom builders. We are a full service firm providing the following services around the Unico Technology: Engineering and load calculation, Duct design and layout, Unico and other materials delivered and sold direct to the builder, developer or building related entity, Work with the builder, developer or building related entity on site to insure proper installation and performance. By taking a direct "hands on" approach, we can insure the comfort of the occupant, the efficiency of the system, the even temperature across the space and the management of moisture inside of the structure. Combilift Combilift manufactures a wide range of 4-way trucks with lift capacities from 2.5 to 25 tons including articulated narrow aisle, pedestrian operated and the Combi-CB 4-way counterbalance truck. The Combilift-SC Straddle Carrier range was developed for handling containers and other oversized loads with capacities of up to 100 tons. CTA Products Group Outlast Q8 Log Oil: EPA registered wood preservatives, stain, End-Cut treatment for Pressure Treated Lumber, Log/siding/deck applications. NBS 30: EPA 25b Exempt Insect repellent additive for exterior paints, stains, coatings. MoldBuster: EPA registered mold inhibitor additive for both interior and exterior coatings. Specialty prep products also available. DuPont Performance Building Solutions DuPont Performance Building Solutions offers a variety of products to help protect the entire home from the foundation to the roof. Our complete line of air-and-water barriers, insulations, roofing underlayments, air sealants and weatherization products help our customers build more durable, comfortable and energy-efficient homes. FastenMaster FastenMaster is a division of OMG, Inc founded in 1981. We are the largest manufacturer of American Made structural screws for the Log Home industry, which includes Olylogs, Loghogs, Logboss and HeadLOK fasteners. We have a complete line of structural and decking screws sold to many retail locations including The Home Depot, Lowes and many lumberyards across the country. Home Group, Active Interest Media The most recognized and trusted multimedia brands in log, timber and recreational housing. Our products provide enthusiasts with the information to buy and build their dream homes, and exposure to the manufacturers and suppliers that provide them. With our new marketing-services division, Catapult, AIM is a full-service strategic media partner facilitating dynamic conversations between you and 30 million enthusiastic followers. Huber Engineered Woods Successful Creativity is a fundamental principle at Huber Engineered Woods. We search for new ways to solve problems. We never settle for the expected or accepted norm, and always search for methods that will help us deliver the highest quality products and service possible. It's a different way of doing business. Not just innovative thinking, not simply maverick approaches, but creativity that makes a difference. ICC Evaluation Service (ICC-ES) ICC Evaluation Service (ICC-ES) is the United States? leading evaluation and certification service for innovative building products, and the most widely used and trusted by code officials, specifiers, architects, engineers, and other industry specialists. ICC-ES Evaluation Reports (ESRs), Building Product Listings and PMG Listings provide clear evidence that products comply with codes and technical standards. Log Cabin Homes Magazine Log home enthusiasts need expert advice about designing, building and maintaining log & timber homes. Log Cabin Homes magazine guides consumers on these important topics and showcases beautiful log & timber homes throughout North America. Log Home Insurance / Roberts & Associates Log Homes Insurance is an independent insurance agency writing Residential Log and Timber frame homes across the United States with multiple carriers. We write coverage beginning with builders risk until completion and then change coverage's to Dwelling with Liability. We also write commercial coverage's for lumber mills and manufacturing related to the log home industry. Log Home Living For more than 35 years, Log Home Living has been encouraging the dream of log-home ownership. Through a wide variety of practical information on all aspects of planning, building, and living in a log home, Log Home Living inspires and guides readers to fulfill and live their log-home dreams. Louisiana-Pacific Corporation Louisiana-Pacific Corporation is a leading manufacturer of quality engineered wood building materials, including OSB, structural framing products, and exterior siding for use in residential, industrial and light commercial construction. LP has over 30 manufacturing facilities in the United States, Canada, Chile and Brazil. M&T Bank M&T Bank offers new construction financing for all types of construction including log, timber frame and modular homes. We have mortgage specialists that are familiar and trained specifically for these types financing. neUdesign Architecture With more than 10 years of experience designing modular projects, we've produced dozens of multi-family buildings. We are licensed across the US and throughout Canada. We are your single resource to coordinate the workflow from Architecture to Engineering to the factory. More than an architecture firm, we are your modular partner. Panasonic Eco Solutions Panasonic is the premier manufacturer of powerful, energy-efficient, ENERGY STAR indoor air quality solutions that quietly exhaust unhealthy, moist air from your home or business. Contractors, builders, architects and homeowners rely on us for our quality, safety, quietness and for the wide array of solutions we offer both homeowners and builders to meet the ever-changing codes of today. Perma-Chink Systems, Inc. Since 1981, Perma-Chink Systems, Inc. has developed a comprehensive system of products designed for the unique needs of log and wood homes. Our finishes, sealants, and restoration products are designed to work together to beautify, protect and maintain your log home. PlyGem Windows PlyGem Windows offers a wide variety of windows, including wood, composite, aluminum, vinyl, vinyl clad and aluminum clad. These products are available in single hung, double hung, casements, and special shapes and sizes. PlyGem also offers a variety of grilles, glass, color options and special-sized jamb widths. Matching hinged or sliding patio doors are also available. Residential Warranty Company, LLC Residential Warranty Company, LLC is a leading provider of 3rd-party, insured warranties to builders, remodelers & manufacturers and is an expert in the field of risk management. Builders seeking coverage options, reliable warranty protection, & assistance in dealing with complex customer service issues choose RWC. Sashco, Inc. At Sashco, we're driven by a passion to make products that work right the first time. Like you, we get frustrated by tires that wear too quickly or stain that fails too soon. It?s why we only make high-performance products designed to keep log homes in dream-worthy, weatherproof condition year after year. We like to call it "delighting the customer with a better way." Simpson Strong-Tie Manufacturer of structural connectors, fasteners, lateral systems and anchoring products. Products are used in wood, metal or concrete structures in the residential and commercial industries. Tamarack Grove Engineering, PLLC Tamarack Grove Engineering is a Structural Engineering firm that continues to grow to meet the needs of a diversified clientele. Through continued growth, one of our specialties has been in the Log, SIPS, Modular and Timberframe industries offering complete Structural Engineering & Architectural Design services including, but not limited to: design, calculations and detailing, framing & foundations, drafting of complete structural related and architectural design construction documents and the wet seal/stamp required for permitting purposes. Collectively, our firm is licensed to perform work in all fifty (50) States and nine (9) Canadian Providences. The Log and Timber Home Show The Log and Timber Home Show is a unique opportunity for you to gather information for your dream home project. Meet with experienced log and timber home companies and attend informative workshops scheduled throughout the show hours! Everything you need to plan, design, build and decorate your dream home is here. Timber Home Living Timber Home Living introduces and showcases the beauty and efficiency of timber homes to an eager audience of custom-home buyers. The magazine?s inspiring photography, informative content, quality advertising, and essential resources involve and encourage readers to pursue their dream of owning a timber home. Unico Inc. The Unico System is a small-duct central heating and air conditioning system manufactured by Unico Inc. Ideal for custom and new home construction, older home retrofits and historic preservation, as well as commercial applications, The Unico System takes less than one-third the space of a traditional HVAC system. Unico recently introduced the iSeries, which features a single outdoor inverter heat pump that runs both high wall units and small duct air handling units at the same time. For more information, visit www.unicosystem.com.